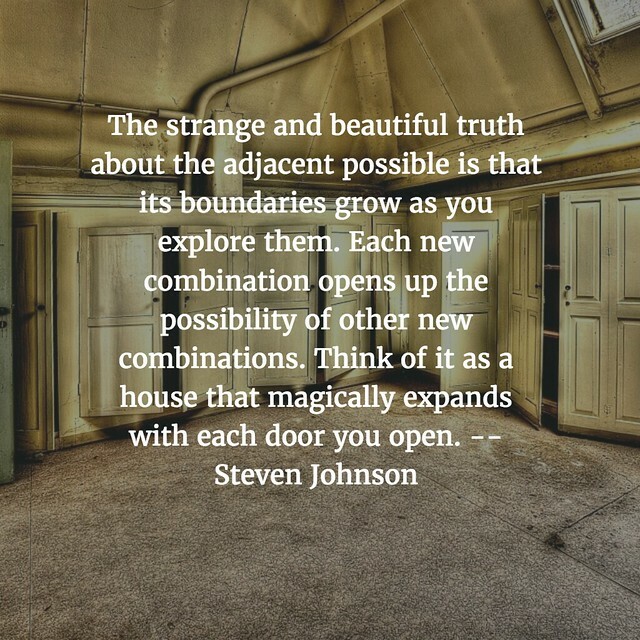 My good friend and creative partner on many an online writing adventure, Terry Elliott, has been using the term “Adjacent Possibilities” for some time now. The term first originated by scientist Stuart Kauffman, I believe, but Kauffman’s insight was centered on scientific inquiry and discovery. Terry has been mulling over Kauffman’s ideas in other realms beyond science, such as writing and creating. (And Steven Johnson has written extensively about it, too). 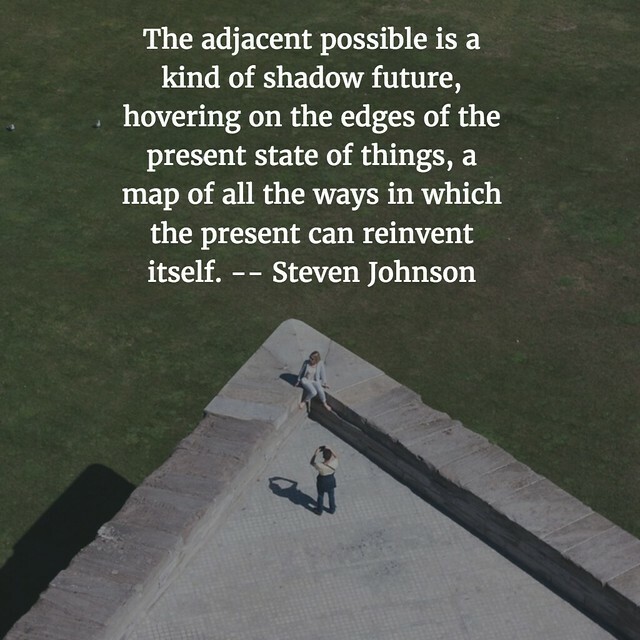 As I understand it, the idea of the Adjacent Possible is that one kind of creative idea spills over into another kind of creative ideas, and that spills over into another creative idea. And so on, so that what happens when you explore something new is that your ending point (if there ever is one) is a few, or many, steps away from where you started, and perhaps miles away from where you thought you were going in the first place. It’s sort of like Six Degrees of Separation, but with ideas and not with people. Terry brought the term up again the other night during the Q/A session of my keynote presentation for the 4T Virtual Conference on Digital Writing as he took the mic, and then later, in a private message, he expanded the notion even further. What he hopes — what I hope, what many of us hope — is that the attendees of the conference and the keynote session do not replicate the kinds of Digital Writing that I shared out. Instead, they will be inspired to make their own kinds of writing. 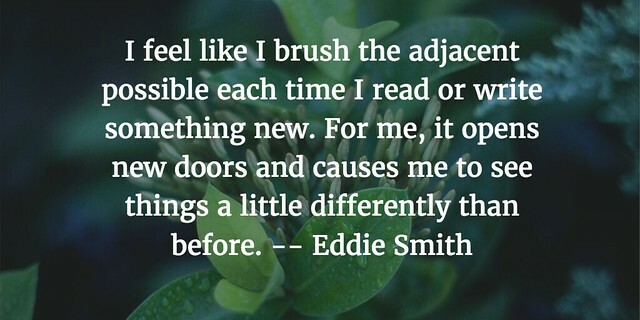 The Adjacent Possible is the notion that we don’t just replicate what we see. Instead, we riff off our discoveries and shift into something new. I’ve written about this from another angle, too. It has to do with bringing in Mentor Digital Texts to my sixth graders, and then noticing how many of them just clone what they saw me share out. Of course, they do. We all start there. Hopefully, then we branch out. For example, I began playing guitar and then shifted into writing songs by ripping off the chords and melodies from bands I loved. Eventually, I began to make my own moves, and left those recognizable chord structures behind. I found my own muse. Helping my students as writers find and then make their own moves, to discover what is not yet visible, is part of why I got into teaching, and why I still love being in the classroom with 11 year old writers. And I tangled with this tension of the adjacent possible the other day, when I wrote about how so many of them are afraid to take chances with their writing. I was frustrated by their confusion over an open-ended writing prompt, but hopeful in what happened. I believe in my heart that I can help my students discover what they can’t yet see. That belief of possibility is the ballast in this age of frustration with the tightening educational systems around us. In the notion of the Adjacent Possible, it seems to me, the skill we need to nurture above all is Flexibility. We need to discover the wiggle room between one idea and the next, and then dive into that gap with possibilities — both that something will be unearthed and that our path may become a dead end (so, start over and try again). Being here is not enough. Being there is where we need to be. A flexible view of the world — not just in writing but in everything — opens up the unknown, and in that unknown, we may find something new about ourselves, about others, about the world. I know this sounds like gobblygook but it rings important to me. It underlies why we write, and why we teach, and why we learn. I had the great pleasure of being the keynote speaker for the ending of the 4T Virtual Conference on Digital Writing last night, and I wish I had had another hour. My aim was to bring to the surface some thinking about our notions of defining the term “Digital Writing” and share out some of the ways in which I use digital canvasses for writing and composition. But I had to rush in the second half of the hour I had in the keynote, due to the clock, and so I didn’t give people enough time to explore some of the projects on their own and the come back to reflect, which was my intention, nor did we get to a collaborative activity around brainstorming the affordances of Digital Writing. Luckily, the session was recorded in the Blackboard platform, and the slideshow and resources will be shared out in the coming days. As I was speaking and sharing, though, the chat room inside Blackboard was a streaming, scrolling site of pretty intense activity by those attending live in the session. I kept an eye as best as I could on it all, but I know I missed a lot of the conversations. The overarching question of why do we need “Digital” as part of the phrase itself — why not just “Writing”? The Word Cloud above is my attempt to gather up all of the chat room and see what themes emerged a day later. It’s cool to look at, but no one element jumped out at me from the chat room, at least in this particular Word Cloud formatting. The Word Cloud image almost invites annotation (ThinkLink? ), so that the phrases and words (I tried to remove people’s names as best as I could) have meaning. Here, they are taken out of context. And, really, context is everything. This week’s theme for DigiLitSunday, facilitated by Margaret Simon, is “mentor,” and I was reminded of a blogging project that I took part in a few years ago, in which a handful of us educators explored and blogged about using mentor texts with students that would lead to opportunities for digital writing and composition. My fellow explorers were Bill and Franki and Troy and Katie and Tony. Bill Bass, who was facilitating much of our discussion, had set up an RSS site to pull all of our posts together into one space. 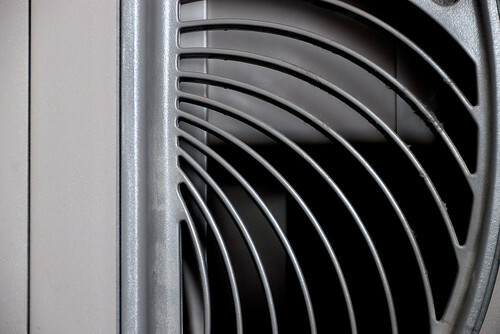 Unfortunately, that space was hosted in Posterous, which kicked the can and died a few years ago. So I have been reading through some of my own posts, to remember what I learned and discovered. I suppose it is a given to say that mentor texts are always important. They provide an entry point into the unknown for many students. 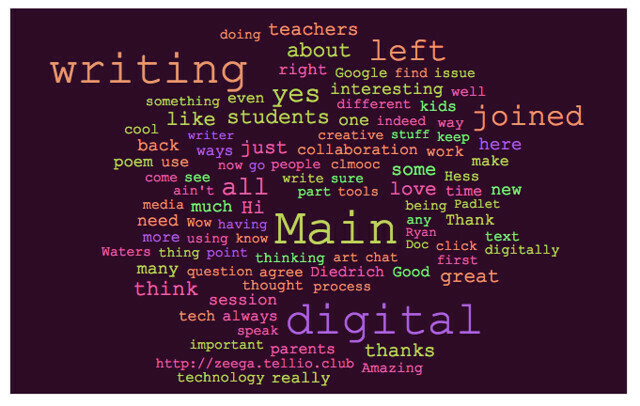 At the start of the year, I asked my students: How many have ever used Google Docs or Slides? How many have used Garageband? iMovie? A blog? I was lucky if I had one or two hands go up in each of the four classes of sixth graders that I teach. We often start at Ground Zero when it comes to introducing digital writing to our students (unless you are lucky enough to have colleagues downstream who connect with technology and writing. Both of those people whom I counted on for that exposure in early grades in my building have retired or left our school.). Given the lack of exposure in school setting for students and digital creation, this means that mentor texts provide a place to talk about what is happening in a piece of digital writing, and then the mentor text itself provides a path for “emulation,” which hopefully leads to branching off into individual discovery and creation. 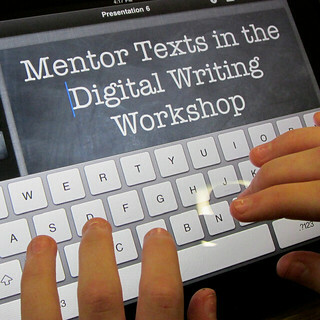 In re-reading some of my own posts on digital mentor texts, I see many ideas still in play in my mind on the topic of digital writing. There is the use of texts in online spaces such as YouTube that can pave the way for my own experimentation, which then helps me consider my students’ engagement in digital writing. Sometimes, my own creation, and reflection, become the mentor text (and if there were failure and struggle points along the way … even better). There is the use of picture books as a primary mentor text for digital pieces because picture books come at art and writing and storytelling from such interesting angles. (Of course, finding the right one — like The Magic School Bus series — is key). I suppose this could now be digital picture books, but I am thinking of traditional picture books where that push the edge of possibilities. There is assessment, and ways to collaborate with students on what they see in a mentor text in order to build an assessment tool for what they will create. Assessment still befuddles many of us when it comes to digital writing, but I think we have more tools in place now, and there is a solid shift to remembering to keep an eye on the learning and not the technology itself. And there is the danger of emulation, of every student project becoming a clone of the mentor text (either the teacher’s shared project or something else) and how to think about moving beyond that problem. The “mini-me” possibilities always surface when students are trying to something new. The role of the teacher is to find each student’s starting point and guide them beyond that point. This is a real struggle for many students, who are taught to do exactly what the teacher expects, and no more. In some ways, this re-reading and sharing brings me full circle again to the power of curation — the choice of mentor texts matter, and the time spent in finding the right text for the right lesson (or the right student) is so important. It becomes the scaffold for moving beyond the mentor text itself. In fact, if successful, the student work will only hint at the mentor text, and perhaps only you and they will know where the infrastructure of ideas came from. Last year, when we finally became a Google Apps for Education school, I dove in with gusto, knowing that my students would be using its platforms all year long (ending in a digital portfolio project). This week, as the theme of DigiLitSunday is about “conferencing” in the digital age, I was thinking again about the affordances offered by Google’s suite of tools. First of all, the fact that students invite me into their piece of writing right at the start — I encourage “comment” mode but many leave me in “edit” mode — allows me access to where they are with a piece of writing. For instance, they are in the middle of a short story (narrative writing) piece, and yesterday, I started to read the openings (our mini-lessons last week were all about strong openings), and I left comments in the margins of everyone’s stories. Next week, as we sit down together, for a one-on-one check-in conference, I will use my notes in the margins to help guide our discussions. In this way, I am moving the process of conferencing along and giving them all something to be thinking about before I meet with them. 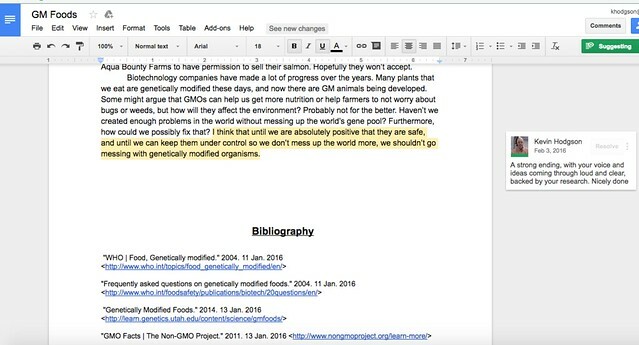 But I am also paying attention to the “history” element of Google Docs, and the changes that are being made to writing pieces by students before and after the conferencing. Did they think about changes and make them? Did they ignore my suggestions and move on with no fixes? I can see it all in the “history” of the document. When we talk about making revision process visible, the “history” button is the most valuable player in Google Apps space. (It also helps if something terrible happens and the story gets lost … we can always find a version of it in the history of the document). Still, I do struggle at times in figuring out the right balance between the margins and face-to-face. I find I have to resist leaving too many notes in the margins, for fear that I am marking up the text to the point of no return for students. It’s no better than the dreaded “red pen” effect at that point. What I want is to leverage the affordances of the digital page to spark discussions in person, so that lessons are learned and writing gets better. 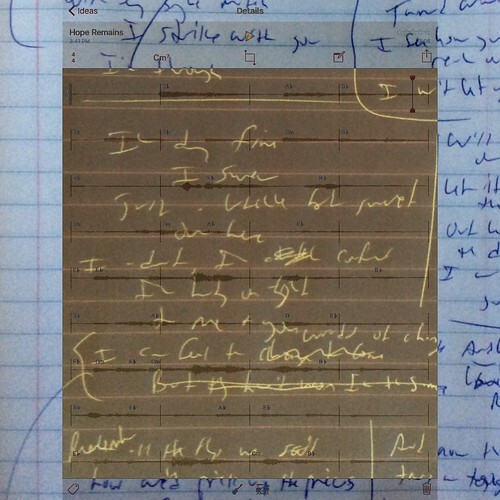 The digital environment helps with that, if I can be sure to couple one (margin notes) with the other (conferencing). That was me, talking to my sixth grade students about some writing last week, during a vocabulary lesson. The lesson has to do with different forms of words in context of a piece of writing and many students struggle with this task because they can’t “hear” the sentence as they “read” the sentence. They only insert the root form, not past/present/future versions. I keep urging them to get the words into the air — their ears will help. This coming November/December, I aim to do Sound Stories with my sixth graders again. It was so successful last year, during Digital Writing Month, as it allowed me to teach the interconnections of writing, voice, sound and media editing, as well as publishing. We don’t do enough with voice in the classroom. This week, for #DigiLitSunday and as part of thinking of innovative teaching practice for the #IMMOOC (Innovator’s Mindset), I am exploring the notion of “audio voice” for revision because I think having students use their own voice recordings in order to revise their written draft work may be a powerful tool for them to use as young writers. Just to make clear: there is another concept we call “voice” when it comes to writing – that of the writer’s voice and tone as surfaced in the writing through vocabulary choice and other techniques — but I am thinking very literal here. I’ve been kicking this idea of voice for revision around for years, thanks to some work done long ago by a Western Mass Writing Project colleague, who used little voice recorders to help her students revise their writing. I always thought she was onto something interesting and powerful. I’ve introduced Voice Typing with my students (via Google Docs) and we’ve done some podcasting throughout the year. We’ve had students use Dragon Naturally Speaking so that they dictate and it types for them when they are struggling writers. 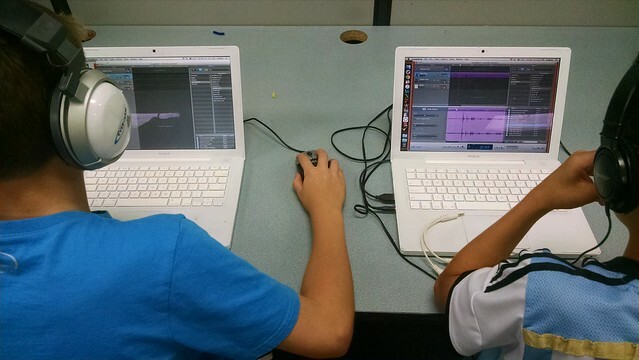 And the Sound Stories project– where students have to use Garageband and list of sound effects to write and record a story — has been another way for voice to come into the mix. But I haven’t yet fully explored how a student writer, during the editing process itself, records themselves reading the rough draft text, and then uses that audio of their own reading to deeply analyze the text itself on a second read. They are their first reader. This seems obvious, but it is not. Many students don’t read through, with close reading eyes, their own writing. Where does the audio reading veer from the text reading because you (writer/reader) automatically made it better in the moment of the live read? What sounds “wrong” to the ear on second listen and how can you fix it? What do we notice about our writing when the text becomes audio? How does your physical voice play a role in what you read? Where in the text can we now revise to make it better and clearer and smoother for the reader? There’s so much learning, and teaching, swirling around in those questions. Certainly, there is no shortage of ways to record voice. Audacity. Garageband. Vocaroo. Soundcloud. There are tons of apps and programs for recording voice. What I want is simplicity — the fewest bells and whistles possible, so that students focus only the sound of their own voice and the words on the page, where the two converge and where the two diverge. That’s what I want from my students, too. 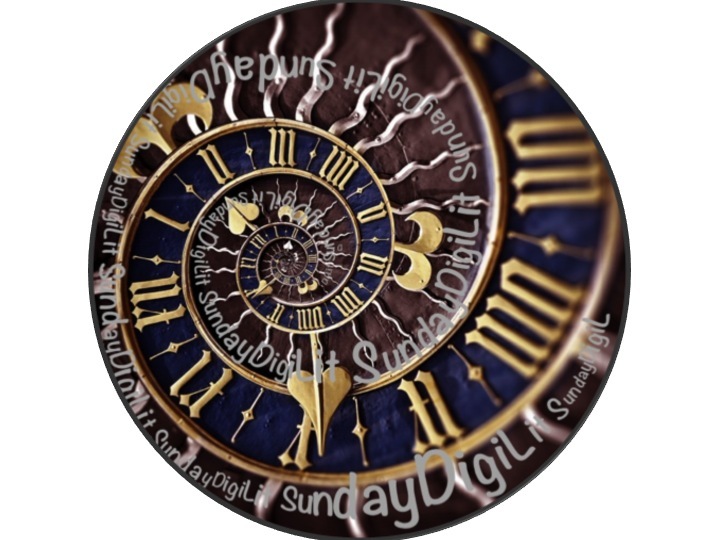 Each week, Margaret Simon puts forth a theme for DigiLitSunday and we are at “reflection.” What a great theme. We need to reflect more, and we need to find ways for our students to reflect more on what they have done or are doing or will do. Last year, I piloted Digital Writing Portfolios (although “writing” became more than just pieces of writing by the time we were done — along with stories, they had comics and videos and video games) and a key element of each project was the act of reflecting. First, they must write a reflection after completing each digital project. This allows some space between the piece itself and the process that went into composing the piece. I find this does not come natural to my students. They need mentor texts and discussions about reflecting. Many struggle with it. Then, during the Digital Portfolio time, they return to all that they have made over the school year and read all of the reflections, and then begin curating their work. Again, they reflect. Why did you choose the pieces and what about those pieces spoke to you? Last year, I didn’t model this final reflective stance enough. I have excuses: we ran out of time in the year, I was still figuring out how to help them use Google Sites for their portfolios, etc. But I know I need to do a better job. If I believe in it, then I need to make time for it. I was wondering how I can adapt what I did for this following video, where I overlaid a reflection of a song I was writing, with the words of the song in motion, and my voice. I found it a powerful experience to reflect on the process. It helped make me a better songwriting, I think. How might this process make my students better writers? How can I manage this kind of digital reflection project in the classroom with so many students? Those are questions I will need to grapple with. What is true, though, is the learning itself is often not in the final project we see, but in the process that comes before and the reflection that comes afterwards. By making those compositional points more visible to students, they can bear witness to how much they have accomplished. By making those points more visible to us, the teacher, we can bear witness to the amazing potential of our students as digital composers. My son was born on Sept. 11. Not the date of the horrific attack on the US. A few years later. My wife and I always say that we helped bring healing on 9/11 by bringing a beautiful baby into the world. But now that he is older, and more attuned to the world, he is asking some deep and probing questions about the nature of the attack whose anniversary coincides with his birthday. For years, we have acted a filter for our kids about 9/11. Not a wall that lets in no information. But as a filter, in which we have tried to let them know of things like the 9-11 attacks, and tried to address some of the reasons (as best as we can discern) for the attacks and the aftermath, and how the world changed suddenly in the aftermath. We’ve had relatives in war zones and I’ve had friends in Iraq and Afghanistan. We’ve filtered the information to provide some Truth (or as best we can figure it) without the devastating imagery that comes with it. It’s a losing battle, ultimately, but as parents (and as educators), we do need to act as curators of digital content for our children. Or we should try. 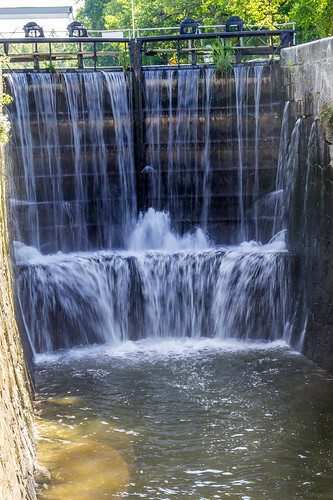 The reality is that filters only go so far, and filters are only as effective as the thinking behind it and the information in front of it, and just beyond the filter lies the floodgates. The Deluge from the Digital eventually will come. The other day, in the car, as we listened to a story on NPR about rescue workers from 9/11, my son began to pepper me with questions about the event. Why did it happen? Was it just New York? (I reminded him that his uncle worked in the Pentagon in the time after the attack there and how devastated he was to see the Pentagon, and the loss of life). What about the other plane? The one that passengers brought down, sacrificing themselves, in order to thwart an attack? Were they heroes? What would I do if I had been on that plane? Could he watch the movie, Flight 93? I was still a filter, slightly more open now, given his age. I provided information (and told him he might need to wait on the movie). I am heartened by the number of books for middle age readers now out about 9/11 and am looking for one we can read together. 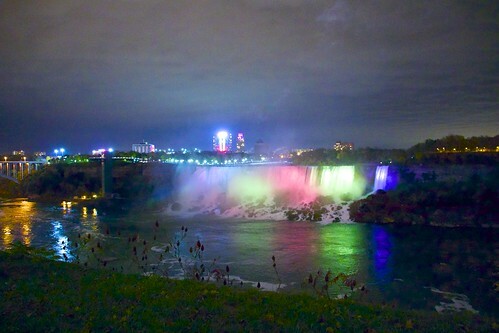 Still, I fear the floodgates. I fear the images he might find if he does web searches when I am not there with him. I worry about when he starts to use social media as a teenager, and hears rumors and false stories about tragic events. I worry that the Digital World, which I often celebrate here and in my classroom, might be the harbinger of lost innocence. I know I am probably already too late, that the world is quicker and bigger and more intrusive than I can ever predict. I’m fast on my feet but not quick enough. I know I can’t be my son’s protector forever. I still worry about it. The best we can do with our children and our students is try to be one of the trusted adults they can talk to, and ask questions of, and to be the ones whom they can turn to when the world turns upside down on them — in small ways and in larger ways. To be that kind adult, though, seems like walking on shifting sands so much of the time. We do what we can and hope for the best.